In this article, I’m going to give you a gift … easy-peasy microbiome diet guidelines that anyone can follow. In my last, we talked about how the microbiome … our internal terrain of 10-100 trillion symbiotic microbial cells harbored by each person, primarily bacteria in the gut plus their genetic makeup … got polluted. If you haven’t read it, by all means … Now we’re going to scour the microbiome clean and feed it righteously! I encourage you to treat dysfunction before it becomes disease. And it actually becomes almost too late for you to reverse the imbalance brought about by inflammation which results in leaky gut which results in … well you name the malady. Forget teflon pans. Their coatings can to cause obesity, thyroid and kidney diseases as well as several types of cancer. Find non-PFOA nonstick cookware … which are more expensive but don’t flake off in your food, causing potential internal pollution. BPA and Phthalates are used in the manufacture of all plastics … and are virtually everywhere. In my kitchen is a mountain of plastics that I’m going to use in a few days in a Facebook Live. All I did was to put them aside as they came into my life … in less than a week! Looking down, I see a huge assortment of food containers, water bottles, wrappers, and even nutritional supplement bottles. Even my coffee capsules are plastic. And Phthalates, which make plastic flexible, can show up in shampoo, hair spray, deodorant, nail polish, insect repellent, and even your shower curtains. And are detectable in meats, tap water, and pesticides … among many other places. These chemicals mimic estrogen and bind to estrogen receptors, therefore crowding out what’s supposed to be there in the first place. And cause a biochemical cascade within fat cells that increases inflammation and stimulates fat cell growth. My take ... avoid plastics as much as you can. I know that's difficult as they're everywhere ... but at least stay clear of plastic containers with the number 3, 6, or 7 on the bottom. Instead, look for the numbers 2, 4, or 5 recycle code on themClick To Tweet, which means they are pretty much BPA- and phthalate-free. When I heard that chlorine was the major disruptor of thyroid function (20 million Americans have some form of thyroid disease and women are five to eight times more likely to have thyroid problems. One woman in eight will develop a thyroid disorder during her lifetime. And that doesn’t account for Hashimoto’s; a recent study hinted at an almost 15% U.S. incidence), I instantly ordered a chlorine filter for my bath. Because thyroid dysfunction runs in my family, I’m a woman, and I’ve had symptoms in the past. And our major exposure to chlorine is in bath and shower water. First week … I started to dream … something I almost never did. And my joints are less inflamed than ever (and I’m 73). Whether this is real or placebo … I don’t care. Don’t forget (pun intended) … excessive aluminum in the brain (where it seems to naturally accumulate) can cause Alzheimer’s. And even though it doesn’t run in my family, I AIN’T going there. Tom O’ Bryan has some simple steps to do this … and I thank him for them. Here are some of his ideas … and some of mine. I’m even going to give you one of my “Fabulous Freebies” … a KICKSTART YOUR HEALTH DIET … so check back soon. I don't care WHAT those chicken people say ... if it's not organic, it's not fit for human consumption.Click To Tweet And that’s not only meats but fruits and vegetables too. Because our whole external environ is pretty polluted right now … so it just makes sense to eat the safest food we can. Yet another multi-million-dollar suit was just settled last week for yet another victim of glyphosate … spraying the pesticide Roundup on fields not only to kill bugs but to get them all to ripen at the same time. Don’t go there! LEARN TO COOK! Huge names in nutrition are encouraging people to cook again. Because we’ve gotten lazy with the onset of fast food. I have to admit that I LOVE to cook … and was a chef at one time. But I’m so busy that I have organic meats delivered. And cook stuff … like the air-fried meatballs I made last week … and the black beans I’m going to make tonight … that I can use in several meals all week. Or freeze in individual glass containers for future use. Frozen or not, at least you’ve cooked them clean. GO GLUTEN, DAIRY, and SUGAR-FREE! 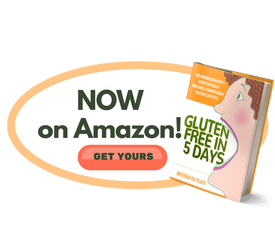 Up to 60% of us are gluten intolerant, and recent research has shown that even those of us who don’t have a wheat problem can get leaky gut in five minutes by eating it. Fortunately, the gut heals quickly too. But constant exposure can eventually cause loss of oral tolerance … and then you’ve got leaky gut. Most of the world (at least 75%) is also dairy-intolerant. Not only that, research has shown that dairy isn’t actually bone-protective (yes, we’ve been sold a fake bill-of-goods by the dairy industry), may increase the risk of prostate cancer by 30 to 50 percent, and increases the body’s level of insulin-like growth factor-1 (IGF-1) — a known cancer promoter. And what can I say about sugar … it not only messes with your insulin and causes weight gain, use has been linked to every major disease. Including the big three … heart disease, cancer, and diabetes. Not to mention fatty liver, cell and skin aging, dementia, kidney problems, and poor dentition. Need I say more? EAT PREBIOTIC FOODS! Prebiotics are types of dietary fiber that feed the friendly bacteria in your gut. This helps the gut bacteria produce nutrients for your colon cells and leads to a healthier digestive system. So they promote the growth of “The Good Gut Guys” … friendly bacteria … as well as producing things that help your metabolism. You don’t have to take fancy pills or potions to get these … simply eat things you can get every day like bananas, apple, oats, and sweet potatoes. A complete list is in my Kickstart Your Health Diet Freebie coming soon! EAT FERMENTED FOODS (PROBIOTICS)! Probiotics are the actual beneficial bacteria … “The Good Gut Guys” … found in your digestive system. And again, you don’t have to resort to pills or potions. Just take a forkful or two a day of foods like kimchi, sauerkraut, pickles, and other fermented vegetables, miso, non-dairy yogurt with active cultures, kefir, and so forth. If this sounds easy … IT IS! There’s no magic to cleaning up and feeding your microbiome to keep it and you healthy. Just follow these simple guidelines. And GET MY KICKSTART YOUR HEALTH DIET COMING SOON! So do me a favor … sign up for The Pegan Diet below to get on my list. The Pegan Diet is the first two weeks of this journey … so by the time you finish with that … as well as adding some pre- and probiotics to the mix … you’ll have it! I tell my list first when new freebies are available.